This fantastic experience is a great intro to the rewarding sports of abseiling and rock climbing. Expert tuition & safety gear included - this is a wonderful combination of two thrilling sports. The Discover Rock Climbing & Abseiling Combo in East Sussex is a fantastic experience that combines two very different outdoor activities! Rock climbing is a hugely rewarding activity; it challenges you both physically and mentally, and thankfully it is also extremely fun! This fantastic half-day course will introduce you to the thrilling extreme sport of rock climbing: you will learn basic climbing and bouldering techniques and have huge amounts of fun ... so it's perfect if you are thinking of taking up climbing and want to see if this exhilarating sport is for you. Next up, you'll travel to the 10 metre (33 ft) high purpose-built Abseiling Tower, where you will get to try another electrifying experience - and one that's guaranteed to leave you buzzing all day! You will learn the basics of abseiling with an trained instructor who will offer you plenty of guidance before you take the awesome leap of faith. Feel your heart race and the adrenaline pump as you experience two exhilarating outdoor pursuits and adventure into deepest, darkest Sussex! Experience the natural thrills these two fantastic sports offer AND feel that great sense of reward as you improve throughout the day!Once you have arrived and been welcomed to the centre your day will begin with a thorough safety briefing covering all aspects of the Rock Climbing & Abseiling experiences and the safety equipment you are to wear. Once briefed you’ll be ready to begin the session with some basic skill learning, including practicing knots & belaying, climbing technique and etiquette and bouldering & safety awareness. 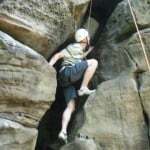 After this great Rock Climbing experience, you’ll be ready to move on and begin the Abseiling. Once kitted out and safety ‘briefed’ you will have a quick theory session on the techniques required to begin your Abseiling adventure. You will have multiple attempts at Abseiling the 30ft tower. Abseiling is very rewarding because your confidence will grow with each descent, improving this great experience further. If you’re feeling confident, you may even be allowed to do it blindfolded! This experience is available on selected dates from March to October. All bookings are subject to availability - please give as much notice as possible. You should have a reasonable level of fitness. NB: This is a new age restriction, so any under 18s with vouchers will still be honoured provided they are accompanied by a participating parent or legal guardian. This experience will last 7 hours in total, starting at 9am and finishing around 4pm. 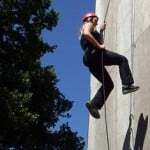 Participants: The Rock Climbing & Abseiling Experience - Sussex is for 1 participant. There will be a maximum of nine climbers per instructor, and spectators are more than welcome to come and watch your climbing and descending adventure! All specialist equipment with be provided by the centre. 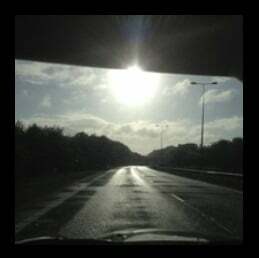 You should wear trainers and unrestrictive clothing that is suitable for the weather conditions. Please bring a packed lunch and plenty of water as there are normally no shops near the crags. Rock climbing courses will only be affected by extreme weather conditions. After the relaxing, tasty chocolate-making experience we did before, it was time to don our trainers and “sensible clothing” to venture out into the great outdoors to try our hand at rock climbing and abseiling! 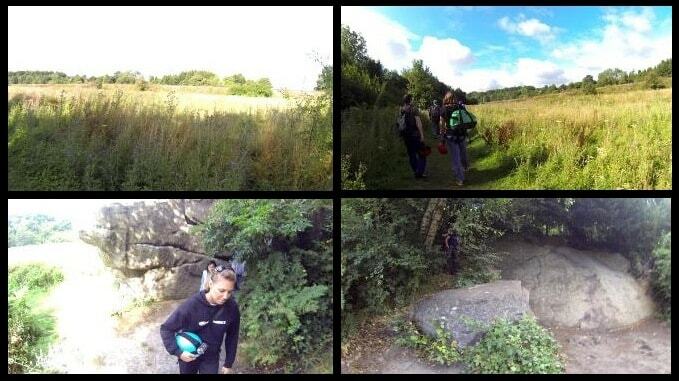 We were kindly invited by Hatt Adventures to participate in these exciting activities, so on August 18th Renata (again – lucky girl) and I jumped in the Mini and headed up to Harrison’s Rocks in Tunbridge Wells. The venue wasn’t too difficult to find, the directions take you to the road outside, then the rocks are signposted from there. In the car park, we congregated with other people doing the experience, and were shortly joined by Kyle and Alex, our instructors for the day. Everyone was really friendly, and even more so when we started handing out free t-shirts! Once we were acquainted, we were strapped into harnesses and given helmets (safety first), then received a short briefing from Kyle. You could tell the instructors really love what they do, the courses are tailored to your needs, and are the perfect combination of fun and learning. The enthusiasm exuding from Kyle while he talked was really motivating, and we found ourselves getting more excited about reaching the rocks. The walk towards where we would be climbing was really picturesque, surrounded by beautiful meadows and wild flowers, it felt great to be outside in nature. The first rock we came across was smooth and upward sloping, and here, we were told, was where we would practise climbing these types of rocks. And what type of rock is it, you may ask? Sandstone! Apparently this is one of the most difficult types of stone to climb on, so after this, any other rock climbing should seem easy (or at least easier). Sandstone can be quite slippery, so friction and contact was paramount, the more hand and foot surface area in contact with the rock, the better. It was tempting to climb on tip-toes, as you might climb a stair case, but we were encouraged to drop our heels and use our palms as well as our fingertips. The more confident climbers went first, slowly inching up the slope (about four or five metres to the top). Renata had done a lot of climbing in the past, so she was a natural! She got up to the top first time, and made it look easy. FYI, it’s not. I tried, I really did, but I’d get half way and start slipping down again – personally I blame my trainers, no grip at all… Luckily for my self-confidence, I wasn’t the only one who didn’t make it to the top, so I was still up for having a go, this time on proper, completely vertical climbing rocks. For these, we needed our harnesses to be attached to ropes, so the first thing we did when we reached Harrison’s Rocks was learn the different parts and methods of loosening and tightening the ropes. Alex also told us some interesting history about the landscape, apparently the rocks were first used by a man called Harrison to test weapons against – you can see indents covering the rock surface made by bullets, hence the name Harrison’s Rocks! There were three ‘routes’ to choose from, in varying difficulty, for us to climb. Alex set up the ropes while Kyle talked us through the proper use of the carabiners, loosening the ropes to give more slack, and tightening the ropes in case people fell. It was quite daunting to know you were holding a rope that could save someone’s life, but it wasn’t as hard as it looked, you definitely don’t have to be particularly strong to hold on (I should know). Once we were happy with the ropes, it was time to climb! Split into three groups over the three routes, there was about four or five of us in each group. Our route was called a ‘chimney’ because it was essentially a big gap between two rocks that you climb up. Apparently this was one of the easier routes, so a good one to start on. Neither Renata nor I went first, so we were able to watch how it’s done before having a go ourselves. The woman climbing, Sam, did really well, she got to the top without falling off once! Then it was my go (eek). Alex gave me a boost to get started (the first part is the hardest, okay? ), then I was on my own. I can tell you, it looks a lot easier when you’re on the ground. The rock is very slippery, so positioning of your hands and feet is super important. I also found I was completely forgetting that I had a harness attached, it felt like I was entirely unsupported, really gets the adrenaline going! About half way up there’s a boulder wedged in the chimney, a great spot to have a sit-down and assess the situation (and my life), and also a lovely view! As nice as it would be to sit there all day, other people would like a go at climbing, so I had to keep going. There were several times when I thought ‘this isn’t going to happen, I’m stuck, I can’t do this’, but it’s surprising how much strength you can summon when people are shouting encouragement at you and the adrenaline is flowing through your veins. At certain times, when you’re flat against the rock, it’s impossible to look down and see where your feet are going, so having people on the ground shouting ‘up a bit! Left a bit!’ was extremely helpful, and before I knew it, I was crawling over the top of the rock. Once at the top, the people below can’t see you anymore, so you’re completely alone with your emotions running wild. We had instructions though, so there was no time to freak out. Shout down that you’re safe, unclip your carabiner, pull up the slack rope, shout ‘All clear? !’, wait for the ‘Yes!’, shout ‘Rope below!’ – then throw the rope down for the next person, easy! I can tell I’m babbling a bit, I can’t help it, this was such a good experience! I’ll try and speed up a bit though. After the first chimney climb, we swapped to a different, more difficult route. I think I was getting a bit tired and sore by this point, because a lot of my progress up the rock face was helped by Renata pulling very hard on the rope, so I was basically being hoisted up the side. But no, I did do quite a lot of it by myself, and when I reached the top it was the most exquisite feeling, I was so proud! It’s difficult to describe the emotion when you reach flat ground (one woman actually cried), but the sense of achievement is palpable. If you’re wondering how you get down from the top, there’s a gradual slope to walk down, and no, you can’t walk up it and pretend you climbed the rock. That concludes the rock climbing part of the experience, we were all very dirty and worn out, but it was great fun (except for when someone found a giant spider and placed it near my foot). Renata was very good at it, obviously, and she said she was really keen to take it up again after the experience. As for me, I’d be happy to try it again after a few more sessions at the gym. Back in the car park, half the group went home, and the other half stayed on for the abseiling. As most people were beginners to climbing, we’d established a real community, everyone was so supportive and encouraging, it was like being part of a little rock climbing family. As sad as that sounds, it’s true, so it was a shame to say goodbye to some people, including Alex, the instructor. The abseiling tower was in a different location, so after a lunch break we were back in the car following Kyle. In the car park we were joined by a few new people, making a total of twelve doing the abseiling. The tower we would be dropping from was 12.5 metres high, at the top you could feel the wind whooshing around you and the tower shake as people abseiled down – quite an experience! The abseiling itself was great fun, you had to have a lot of trust in Kyle holding the safety rope and the strength of the harness holding you, I never got used to the sensation of leaning back off the tower and letting the rope take your weight! After a couple of turns down the tower, Kyle had us doing a few tricks like abseiling blind-folded, doing the upside down Spiderman pose, spinning on the rope or going no-handed. So much fun! Kyle was hilarious and put everyone at ease, no one lost enthusiasm and there was always a congratulatory round of applause when you reached the bottom. At the end of the day we were all exhausted but very pleased with ourselves, we’d met some great people, learnt new skills and had a very enjoyable time. Massive thanks to Kyle and Alex for being so helpful and entertaining, it was the perfect combination of educational and fun. 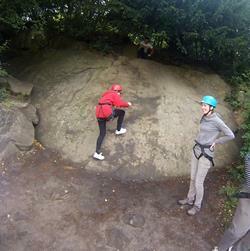 There were very young children climbing next to us on the rocks, so this experience would make a great family day out, as well as a new and exciting activity for people who love adrenaline and the great outdoors. Experience Days recently spoke to ‘Hatt Adventures’ in an interview to find out what the future holds as well as some background about the company itself. 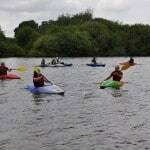 Hatt Adventures have a broad range of outdoor activities that include; kayaking, abseiling, outdoor climbing and mountaineering. We spoke to founder and director; Tom Hatt in order to find out more! Please explain a bit about the history of Hatt Adventures. Where did an interest in the industry stem from? We have operated since 2005, and have steadily grown each year. The business was started by Tom Hatt who wanted to share his passion for all things adventurous with other likeminded souls. Within a year or two the business grew and Tom recruited some of his instructor friends to run the odd course when he was double-booked. The rest as they say is ‘history’. Today, we have a number of highly skilled and experienced instructors running a wide range of adventurous courses including; climbing, kayaking, abseiling, mountaineering and much more. How did a passion turn into a career? Today we offer courses for a wide range of clients, from individuals to corporate events, stag and hen parties through to kid’s parties and school groups. For the office side of things the greatest challenges we face are making sure everything runs smoothly and we have a great team in myself and the two Clare’s who keep everything in shape. Personally I love teaching the technical side of things; from complicated rope work to paddle strokes for surf and white-water activities. Do you have any exclusive information you can share with us? We have a couple of big projects in the pipeline, but these are top secret at present! We’ll let you know more as soon as we can. We have just launched a new climbing course and a river trip on the River Arun in Sussex. What makes your experiences unique and special for customers? Quite simply it’s our staff and instructors! We only use the best instructors and we’d rather not run a course that will lower our standards!! 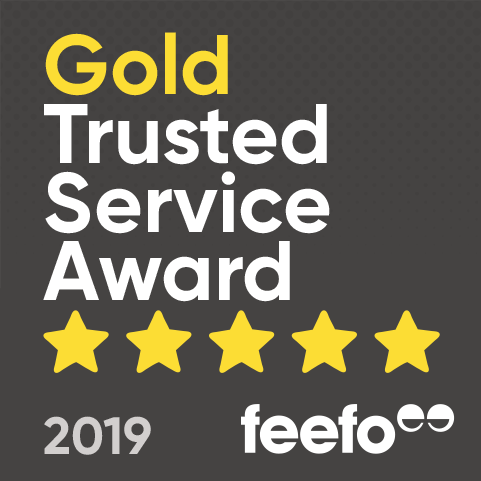 This can be seen by our reviews on Trip Advisor. What’s your most frequently asked question from customers? Our availability; we generally get booked up a long way in advance and people always seem to leave things to the last minute. We always try and help if we can but like we said before we only use the best instructors around! Can I book this rock climbing and abseiling experience in the winter? This rock climbing and abseiling experience is seasonal - this means that it is NOT available throughout the winter months, between October and March. Will this Rock Climbing and Abseiling Experience go ahead in the rain? This climbing experience in Sussex will go ahead in the rain, if the instructor deems it to be safe. If the instructor decides that conditions are not safe for climbing, then the booking would be re-scheduled for an alternative date.